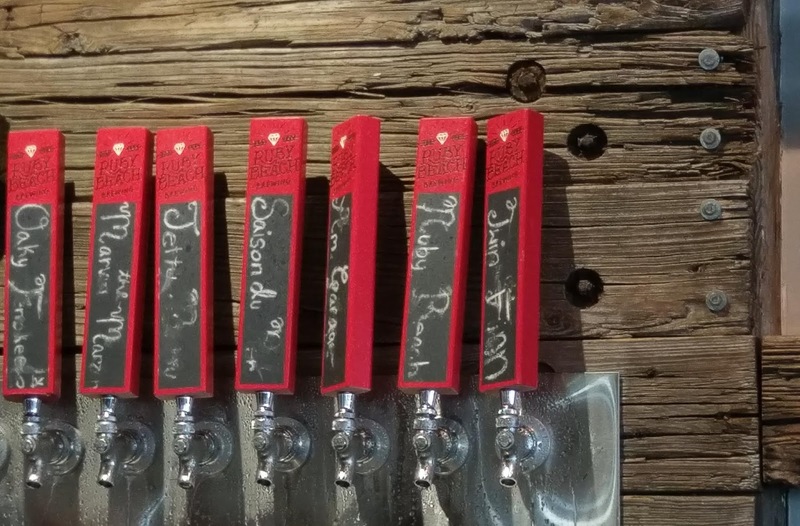 Drawing from local history, Ruby Beach Brewing takes its name from the early establishment of "Ruby Beach" in 1884. According to the press release, investors of the old Jacksonville & Atlantic Railroad looked at the possibility of creating a resort area along the beach. 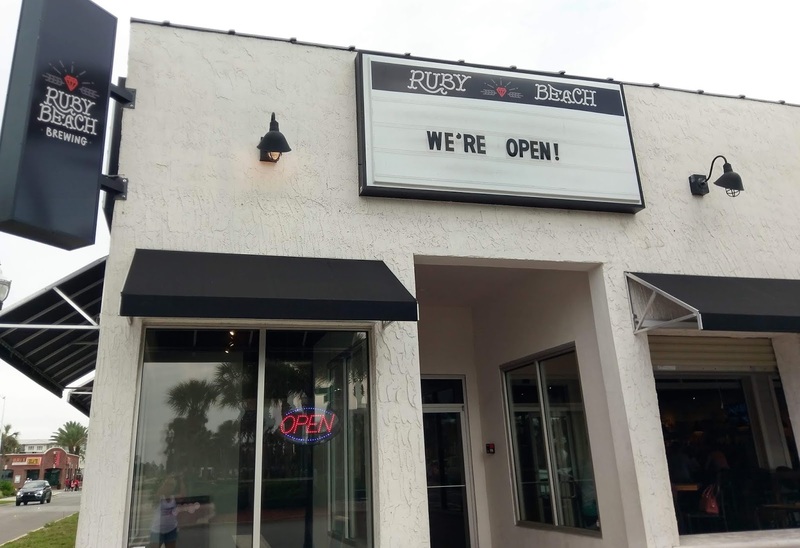 The first settlers, William Scull and Eleanor Kennedy Scull, built the community's first house, and Eleanor named the settlement "Ruby Beach," after their daughter (the area was later renamed "Pablo Beach," and then Jacksonville Beach). Following construction and renovations at the property, the inside of the new Ruby Beach Brewing has a larger, more open, feel. The center bar has been removed, and the new bar is positioned along one wall. 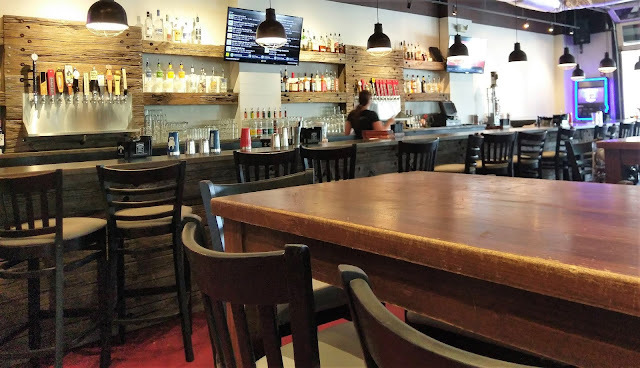 Wood planks from an old pier are the focal point of the bar, creating a beachy, boardwalk feel. 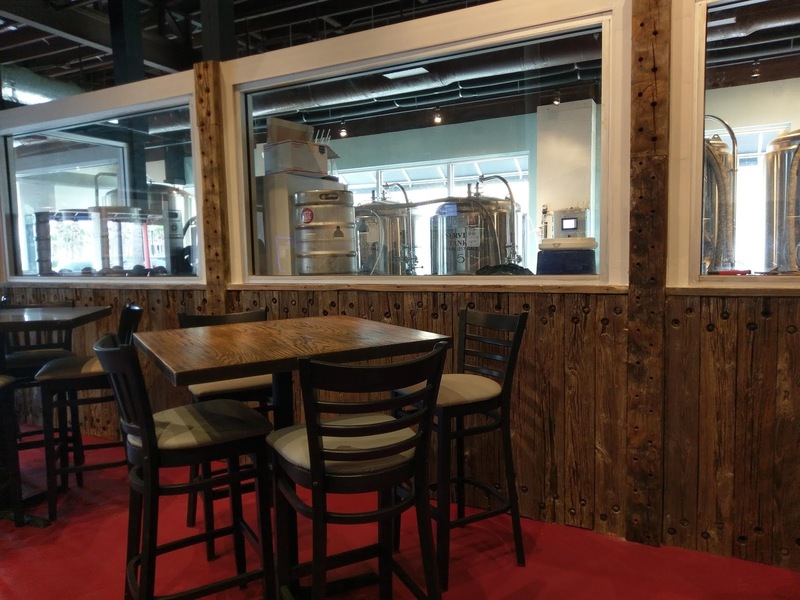 Long wood tables sit in the middle of the space, with additional wooden tables and chairs along the brewhouse side. If you're looking for those seabreezes, the venue still features the open-air front patio. The bar features 24 taps, with Ruby Beach Brewing house beers brewed on site, in addition to guest taps, including cider and kombucha. The electronic menu board lists a good variety of beers. A full liquor selection is also offered. 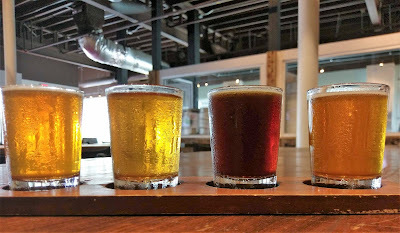 Pours of beers are pint (generally, with a few exceptions) or by flight of four. 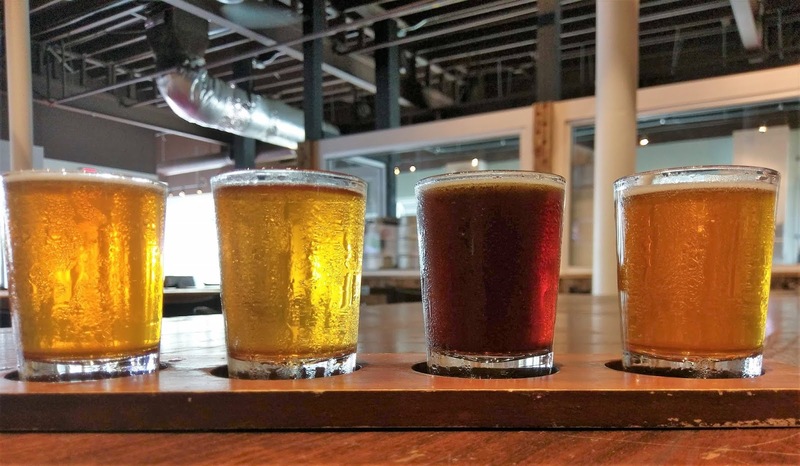 The above photo includes Oakyfenokee DIPA, Marvin the Marzen, Boardwalk Cafe Brown, and Jetty Betty Honey Beer (left to right). Off to the side was also a full pour of Twin Finn Lager, which is a repeatable go-to beer: bready with a pleasant sweetness. The Jetty Betty Honey Beer is light, with a slight, but noticeable, sweetness that isn't overpowering. A lighter marzen, the Marvin the Marzen drinks easy with the signature maltiness of the style. The DIPA has a number of flavors coming through with woodsy, even minty notes, and a lingering bitterness on the backend. If coffee beers are your thing, the Boardwalk Cafe Brown Ale has a very pleasing roasty coffee aroma, with a smooth coffee taste, without being bitter. 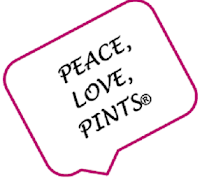 Beers are reasonably priced at $5-6 drafts (a few higher ABV beers are priced at $7). Crowlers (32 oz. cans; $10-12) are also available to-go. If the munchies set in (and they did on my visit), the on-site kitchen offers an assortment of finger foods and hand-helds: pretzel sticks, cheese curds, fried pork rinds, nacho fries, hummus and flatbread combo, shrimp tacos, fried shrimp basket, roast beef hoagie, roast pork sandwich, burger, and mini-brats. 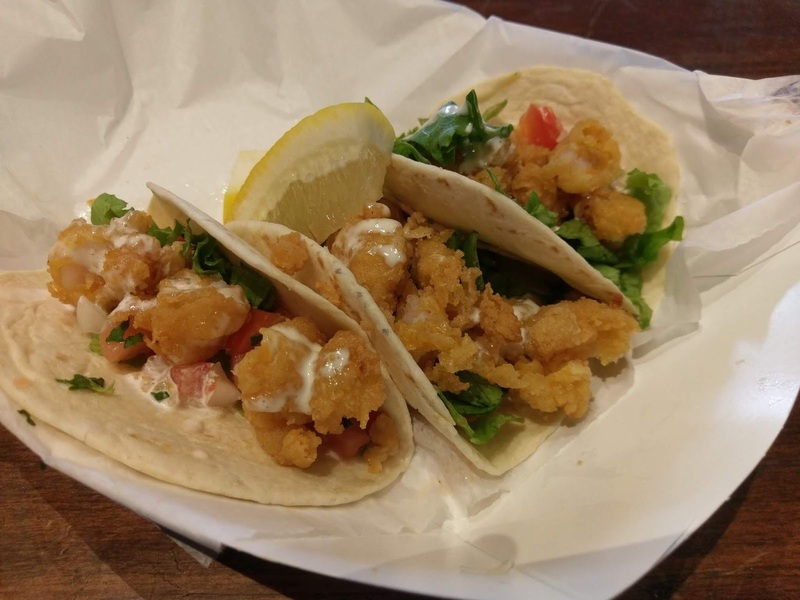 The shrimp taco boat has three mini-shrimp tacos, filled with juicy, lightly-breaded shrimp drizzled with a lime aioli: tasty! 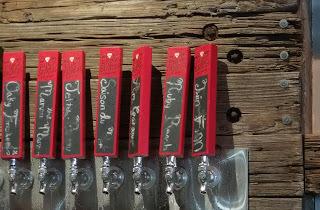 With the renewed emphasis on craft beer at Ruby Beach Brewing (rather than being a bar with a brewery), the place already feels more like a brewery and tap room than it did before, and it will be interesting to watch the beers that Head Brewer Billy Arthur brings out of the on-site seven-barrel brewhouse going forward. 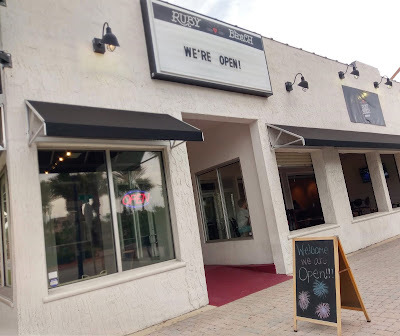 Ruby Beach Brewing is located at 131 - 1st Ave. N, in the heart of Jacksonville Beach, a short walk to the beachfront (meaning that you might want to take a Crowler to go!). 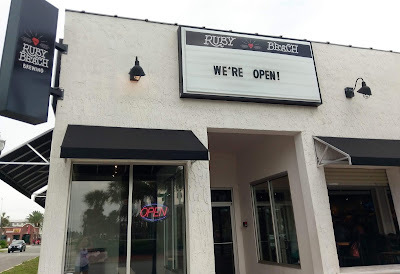 Congrats to Ruby Beach Brewing!